Since it was founded in 1992, World-renowned oenologist Alberto Antonini’s involvement and direction serves as a guarantee that this wine is produced to be the true expression of this historical appellation. Grapes that produce Palladio wines are grown in the Montalbano district near the historical cities of Florence and Siena. Vineyards thrive in this area. The soil is composed mostly of clay schists, commonly called galestri, which are rich in structure and poor in organic substances. The local climate, usually a mild winter, rainy spring, hot summer and temperate autumn, is perfect for the maturation of grapes. Even in winter, rainy periods usually alternate with crisp, sunny days. Snowfall is rare and when it does occur, it melts quickly. 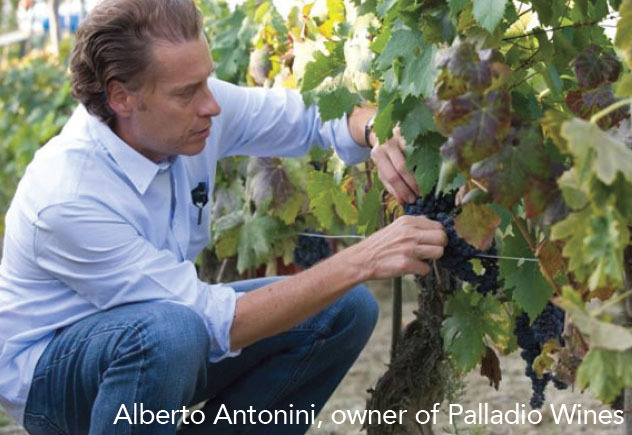 At Palladio, quality winemaking begins in the vineyard where management is constant and the greatest emphasis is placed on the selection of quality fruit at harvest. When Andrea Vecchione, proprietor of San Quirico, replanted his original 27 acres of vineyards more than 20 years ago, he was one of few in the area of San Gimignano who took a scientific approach to the task. The results have been so outstanding that his vineyards are now a prime source for select grafting. With their southern and western exposures, Andrea’s vineyards have now doubled in size, while his approach to winemaking still has but one yardstick: quality. His winery is small but efficient and equipped to produce state-of-the-art wines. 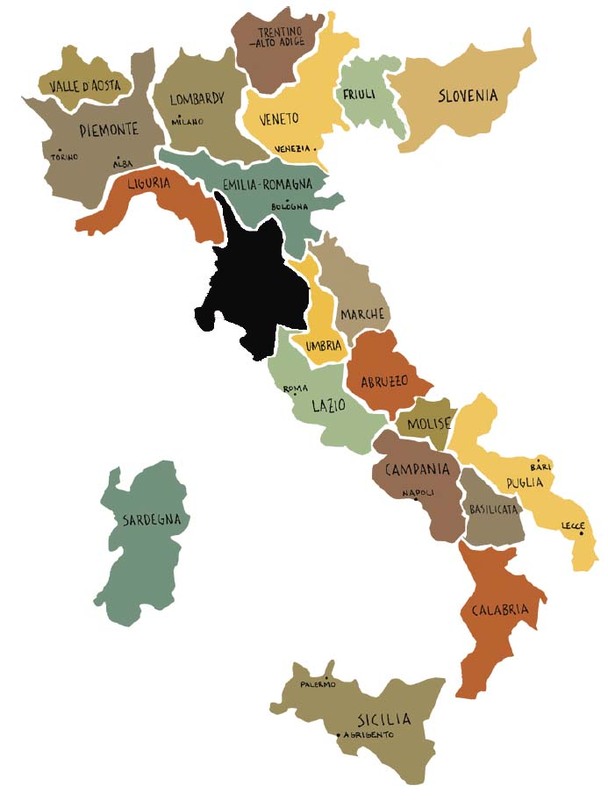 In 2004 San Quirico obtained USDA NOP (National Organic Program) certification for their organic products and the 2005 vintage was the first to be labeled as such. The “Tenuta di Ghizzano” (Ghizzano Estate) is one of the oldest farms in the area and also one of the most innovative. Today it is made up of about 350 hectares of which 20 dedicated to vines, 20 to olives, 150 hectares of cereal and the remaining 150 is made up of woods and poplar groves. The aim is to cultivate a high quality product, limited in quantity and which fully reflects the characteristics of this area without forgetting the style, elegance and rich fragrances of the rolling hills which surround us. At the same time they are investing in natural winemaking and agriculture. In 2003 they started to move over to organic farming and since 2008 we have been officially recognized as organic by the relevant authorities. Charles and Molly Meeker bought their first vineyard at the end of West Dry Creek Road in Sonoma County’s Dry Creek Valley in 1977. 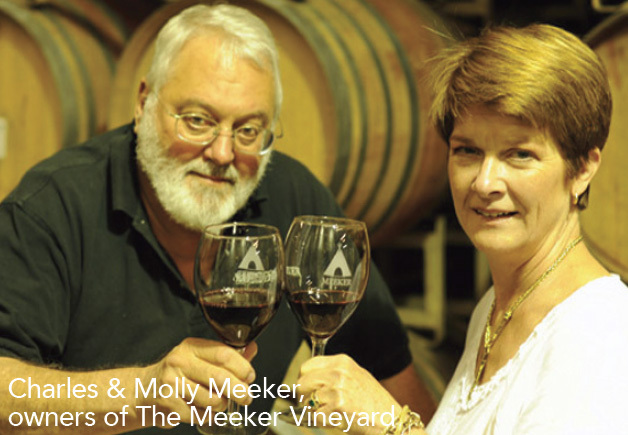 In 1984, Charlie and Molly established their winery — The Meeker Vineyard — with Charlie as the winemaker. 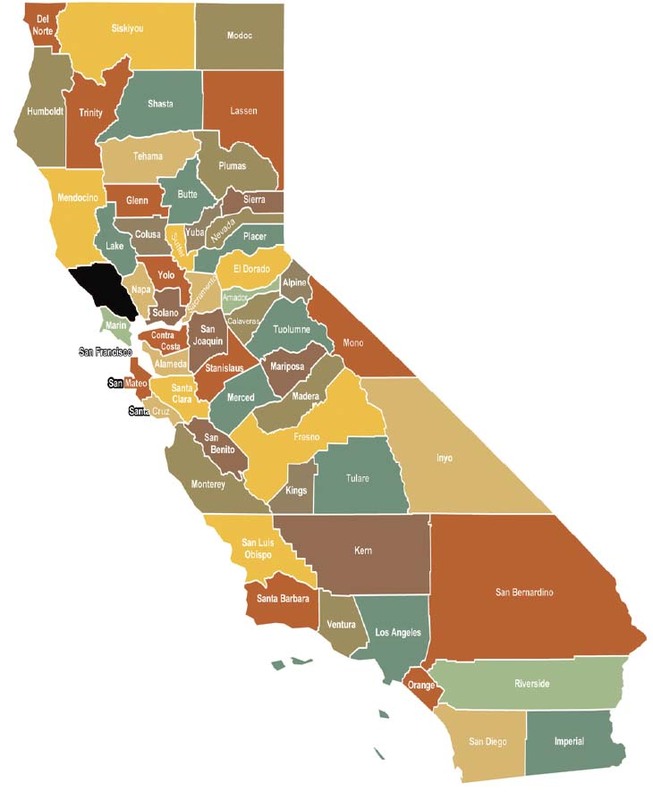 In the early 1990’s Sonoma rapidly became a prime target for wine-tasting tourists. At this point, The Meeker Vineyard winery consisted of a 1,664 sq. foot building with no tasting room and only a tiny wine lab in which to welcome growing numbers of visitors. In an act of desperation, Meeker erected a 40-foot-tall tipi (an authentic Sioux tipi in every respect except size) beside the winery and began using it as a tasting room. This crazy idea worked, and the legend of the tipi remains part of the history. Palladio Bianco 2016 is golden light color with greenish reflections and consists of 60% Chardonnay, 20% Trebbiano, and 20% Grillo. On the nose, it boasts of pleasing and delicate scents of flowers and tropical fruits. This wine is full flavor, harmonious, with a persistent aftertaste boasting of green apple. The Palladio Bianco Italiano VdT 2016 is smooth and inviting from start to finish. This food friendly Bianco is an excellent companion to shellfish, seafood and fresh pasta dishes. Alcohol 12%. Palladio Chianti DOCG 2015 is bring ruby red in color and is made from 85% Sangiovese, 10% Canaiolo, and 5% Colorino. It offers inviting aromas of black cherries, blueberries, and elderberries. On the palate, this wine is fresh and easy-going boasting of tobacco and cracked black pepper. The flavors are brought together by soft tannins, refreshing acidity, and boasts a persistent finish. Pair this wine with beef ravioli, barbecued meats, pasta e fagiole or minestrone soup. Alcohol 12%. San Quirico Vernaccia di San Gimignano DOCG 2016 is straw yellow in color and is 100% Vernaccia. The gentle floral and citrus aromas complement undertones of stone fruit and fresh herbs. On the tongue, this wine boasts of strong lemon zest and hints of sage. This wine stays crisp to the finish with hints of anise and almond that stay on the tongue. Pair this crisp, unoaked white with insalata di mare, salmoriglio, calamari grigliati, and chicken scallopini. Alcohol 13%. San Quirico Chianti Colli Senesi DOCG 2016 is intense ruby red in color and 100% Sangiovese. It exhibits notes of fresh cherries, tobacco, and violets. On the palate, it is generously well-rounded with lively acidity and finished with strong, firm tannins. Pair this wine with cioppinos, tomato and olive sauces, orecchiette arrabbiata, and even penne with vodka sauce. Alcohol 13.5%. Il Ghizzano Rosso 2015 is ruby red in color and consists of 95% Sangiovese and 5% Merlot. It has velvety berry notes on the nose. On the palate, this wine boasts of cherry, blackcherry, and warm spice. This wine finishes strong with firm tannins and a lingering aftertaste. Pairs well with beef and venison. Alcohol 13.5%. Tenuta di Ghizzano Nambrot 2014 has a dark ruby/garnet color and consists of 60% Merlot, 20% Cabernet Franc, and 20% Petit Verdot. It exhibits rich and concentrated notes of blackcherry, cassis, and red fruits. Firm tannins hit the palate with hints of vanilla and spice. This wine finishes elegantly with subtle hints of nuts and fig. It pairs with bold game meats, pungent aged cheeses and most beef and lamb. Alcohol 13%. Tenuta di Ghizzano Veneroso 2013 boasts of a medium/deep ruby color and consists of 70% Sangiovese, and 30% Cabernet Sauvignon. Notes of black cherries fill the nose. On the palate, this wine is smooth and elegant with hints of dark chocolate, vanilla, coffee, and pepper. This wine has a great mineral quality and brags of a lush texture from start to finish. It pairs well with a bit of salami, proscuitto, or some hard cheese. Alcohol 13%. Meeker Vineyard 2013 Lobster Cove Chardonnay is 100% Chardonnay, is light in color and boasts of orange blossom, green apple, pineapple, and lilikoi on the nose. This smooth and crisp wine hits the palate with hints of apple, lemon zest, and wet granite. This leads to a very clean, crisp, lemonade finish. Alcohol 13.4%. Meeker Vineyard Rollercoaster Red is the perfect blend of eleven different varietals, Syrah, Petit Syrah, Cabernet, Sauvignon, Zinfandel, Cabernet Franc, Barbera, Petit Verdot, Carignane, Merlot, Malbec, and Grenache. It opens up on the nose with hints of berries, coffee, cola, and earth. On the palate you will notice black cherry cobbler and spice. This wine finishes strong with hints of French oak and vanilla that are left lingering on the tongue. Alcohol 14.6%. Meeker Vineyard 2014 Dry Creek Valley Chardonnay consists of 100% Chardonnay and is deep straw yellow in color. On the nose, you will find ripe apricot and lemongrass, with subtle notes of tropical fruits like mango and pineapple. On the palate, this well-rounded wine has a balanced fruit character like apple chutney and the texture of a crème brulee. This wine finishes broad and clean with a touch of vanilla and chamomile. Alcohol 13.7%. Meeker Vineyard 2014 Hoskins Ranch Grenache is 100% single vineyard Grenache, is ruby red in color and boasts of cherry and strawberry on the nose. The palate is met with hints of strawberry-rhubarb pie, cherry blossoms and spring blossoms. This wine has a seamless medium structure and elegant tannins, supported by bright acidity and a long, soft finish. It’s the perfect before dinner winner and goes well with any aperitif. Alcohol 14.8%. Meeker Vineyard 2012 Sonoma Coast Pinot Noir is 100% Sonoma Pinot Noir with medium ruby color and boasts of cherry on the nose. On the palate, you will notice cassis, fruit punch, cherry pie, and vanilla pound cake. This wine has a medium structure and firm fade into a gentle finish and medium acidity. It will pair with a nice pork loin or duck breast. Alcohol 14.7%. Meeker Vineyard 2013 Four Kings Bordeaux style blend, 60.9% Cabernet Sauvignon, 22.8% Cabernet Franc, 15.3% Merlot, 1.0% Petit Verdot, shows bright white cherry cobbler, baking spice, and coffee grinder dust. It also shows high notes of vanilla, dark chocolate, and lavender. It is a bit of a lighter style blend but still wouldn’t hurt to decant at least 30 minutes. It does need to open up a bit. Alcohol 14.7%. Meeker Vineyard 2008 Four Kings Bordeaux style blend is smooth and boasts of leather and chocolate on the nose. The palate is met with hints of soil, spice, and gentle mocha. There are also hints of smoky oak and lingering fruitiness that keeps the wine tasting fresh. This Bordeaux style wine is a lighter style also consisting of Cabernet Sauvignon, Cabernet Franc, Merlot, and Petit Verdot. It is easy drinking and, ready to drink, but should be decanted for a bit. Alcohol 14.8%. Combine the first six ingredients in a bowl to make the sauce, set aside. Add the zucchini & carrots, sauté until tender. This will take approximately 5 minutes. Add the sauce and the green onion (set a bit of the onion aside for garnish) to the zucchini carrot mixture until everything is hot and well combined. Plate and garnish with sesame seed, lime wedges, green onion & cilantro.